Lagos have been sentenced to five years of imprisonment each with hard labour for breaking into six shops at the Ijeh Barracks POWA market to steal properties valued at N194,000. The convicts are Kingsley Bassey,aka Azonto, 22 and Johna Mamman, 20. Mamman resides with his parents on Line A, Block 3, Room 11 at Ijeh Police Barracks. The convicts were sentenced by Senior Magistrate A.T Omoyele in charge of Court 12 at the Igbosere Magistrate Court, Lagos after she found the convicts guilty of the three count charges of conspiracy, breaking, entry and stealing preferred against them by the Police at the Dolphin Division, Ikoyi, during the trial spanning four months. Police alleged that the journey to jail started for the convicts on 10 July, 2017 when they connived with others still at large to break into shops 1, 2, 3, 5, 6 and 15 at the Ijeh Barracks POWA market and carted away cash and properties valued at N194,000. 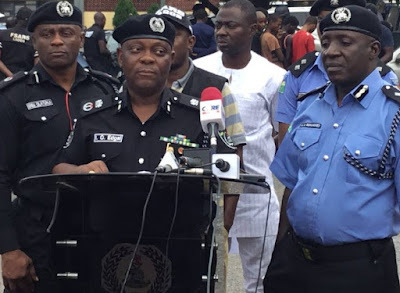 It was gathered that following the incident, the owners of the shops the Police identified as Dupe Kayode, Odion Frank, Mrs Oni and Mike Ologwu reported the theft to the Police. Following the report, detectives swung into action and arrested the convicts at a hideout at the Ijeh barracks following a tip off and took them to the Station. During investigation, according to the Police, the convicts confessed to the crime and were arraigned before an Igbosere Magistrate Court, Lagos on a three count charges of breaking, entry and stealing. The, offences, Police prosecutor, Cyriacus Osuji in charge No L/39/2017 were punishable under Sections 411, 307 (7) and 287 of the criminal Laws of Lagos State, 2015. Magistrate Omoyele found the convicts guilty of the crime during the trial and subsequently sentenced them to five years imprisonment each with hard labour without an option of fine with a directive that the sentence would run concurrently.